Coldwell Banker's IT staff took a backseat to marketing when the real estate brokerage rolled out Facebook at Work. The program is just a pilot, however, and IT will eventually have to step in if the company decides to integrate the platform with corporate resources. Coldwell Banker is one of roughly 300 organizations that received early access to Facebook at Work, and it is the first U.S. real estate brokerage to use the new platform for workplace communication. The company began inviting agents and employees in its Southwest region, which includes branches in Southern California and Arizona, to join Facebook at Work in October. Coldwell Banker employees now crowdsource answers to colleagues' questions and requests on everything from recommendations for roofers, advice about property listings and the whereabouts of files stored on the company's Intranet, using Facebook at Work, according to Randy Bragdon, Coldwell Banker's regional marketing director for the Southwest region. Coldwell Banker managers quickly noticed that staff who may have never responded or engaged with others via email actively participate on Facebook at Work, according to Bragdon. "Those walls have come down, so it helps us at a corporate level because they're all self supporting each other." Processes that in the past would have started with an email and dragged on for hours, or sometimes days, are now "asked, answered and closed" within five minutes on Facebook at Work, Bragdon says. The platform quickly became a virtual water cooler for many of the company's remote employees who are rarely in close proximity to each other. Today the company primarily uses Facebook at Work as a tool for casual interoffice communication, but the potential future use cases are many. Coldwell Banker's deployment of Facebook at Work didn't follow the typical IT pilot and approval cycles, however. The company's IT department mostly watched from the sidelines as the brokerage's marketing team lead the rollout of Facebook's new collaboration suite, which is currently used by thousands of Coldwell employees. Bragdon and his marketing colleagues drove the entire initiative. He says he applied to be a Facebook at Work beta tester multiple times during the past 12 months. "This was a little bit unique in that IT wasn't involved, only because there were all these instances where Facebook Groups already existed that we had no control over, and that was really another issue for us," he says. Bragdon did, however, provide all the necessary details and documentation to Coldwell Banker's IT channels prior to the Facebook at Work deployment, and he received the go-ahead to proceed with a limited pilot in the Southwest region. Although Facebook at Work is a private network limited to Coldwell Banker employees, its IT staff views it as a social media tool, which means employees are obligated to follow the same official corporate standards and practices the company has for other social sites, such as Twitter or Facebook, according to Bragdon. "Our argument from the marketing side is this is happening already, so how do we make the best of this… new way of communicating in a blend with our company's policies and procedures," Bragdon says. "We're hoping at some point we can get this integrated with single sign-on, and that's really where we're going to have more of the IT buy-in." Less than two months ago, Bragdon identified 11 office locations that already used Facebook Groups heavily (and one more office that did not) to pilot Facebook at Work. Among the 1,100 employees associated with those offices, nearly 55 percent of them signed in and set up their accounts within 10 days, Bragdon says. Shortly thereafter, Coldwell Banker flipped the switch on all of its employees in Southern California. At the end of November, less than two weeks after invites were sent to 4,500 employees, the overall sign-up rate was 33 percent, according to Bragdon, who expects the majority of those remaining employees to join in the near future. Plans are also underway to bring on employees in the Arizona offices. Bragdon considers the early adoption rate a success, "especially in an industry where you have a wide range of users," he says. "This is something new. Luckily the Facebook name of the product helped. 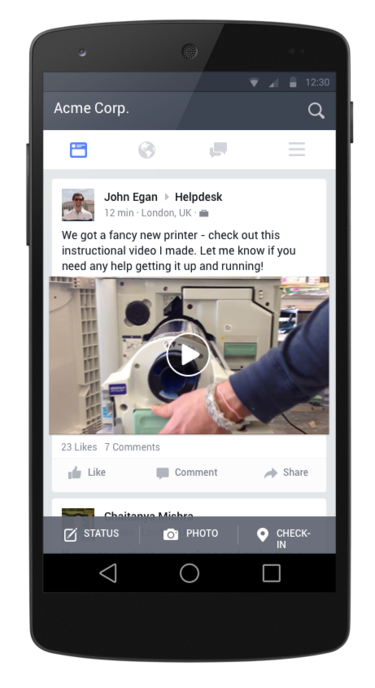 [Employees] kind of understood enough about Facebook to … be really comfortable with it." To proactively address any concerns Coldwell Banker staff may have about mixing personal and work information on Facebook, Bragdon tried to be as clear as possible about how the tool works. 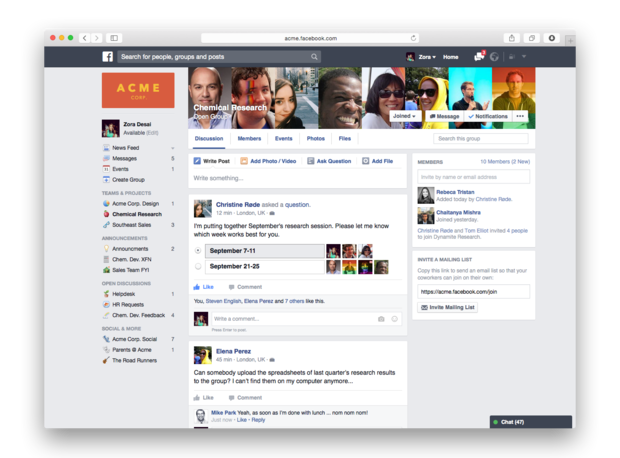 "The way that we describe it is: ‘It is built off of the Facebook architecture, but it's its own private ecosystem. There are no ads, there's no Candy Crush,'" he says. "It really is this collaboration and communication platform that's again just built off of the familiarity of Facebook." Bragdon and Facebook both say user information is never shared between personal and work accounts. "Nothing shares in any direction," he says. "You can't share content from the Facebook at Work profile onto anything outside of that ecosystem." Facebook at Work has been available as a limited pilot for about 11 months, but the company doesn't plan to make publicly release it until early next year. Representatives from Facebook talk with Bragdon every two weeks to collect feedback about challenges and limitations, and to answer questions. One such limitation: a "seen by" feature that shows the specific users who have seen posts in Groups on Facebook at Work. Bragdon says the tool is valuable, but when a Group reaches a certain size the seen by feature disappears. He also had issues changing passwords and getting some people signed up, particularly those who want to use their personal domains as login credentials instead of Coldwell Banker's. He also requested additional controls or permissions to better manage employee access to certain Groups. Despite these relatively minor complications, more than half of Coldwell Banker's regional executives joined Facebook at Work, and more than 40 percent of all users use the mobile app, Bragdon says. The brokerage posts only non-sensitive company information to Facebook at Work, but Bragdon hopes to eventually reduce email chains and move its internal blog posts from the Intranet and onto Facebook at Work. Though Bragdon is happy with the level of early engagement, he understands Facebook at Work may never be a good fit for employees in HR, accounting or other departments that regularly access confidential corporate data. Such information on employees and customers must be protected regardless of the tools at Coldwell Banker's disposal, he says. "It is an experimentation, but I will say out of the box, we are finding great success with it."